Does anyone read the DrudgeReport anymore? Apparently they do because Mediabistro's FishbowlNY called our attention to an ad that appeared on the front page of Drudge Sunday, December 30. Viewing the screenshot FishbowlNY took you might ask "what ad?" Your query would make perfect sense since the ad looks exactly like an editorial entry. The ad, promoting a Portfolio magazine article, does carry a disclaimer of sorts which reads, "Support The DrudgeReport; Visit Our Advertisers." Nice, but the disclaimer doesn't specifically point out the editorial just above it is, seemingly, a paid placement. Display ads have appeared before with the disclaimer but ads created to look exactly like an editorial piece begin to straddle the line (if there still is one) between advertising and editorial. Some will note Adrants does a similar thing. Occasionally, a block of text will appear as the second story on the first page of the site. It carries a different background than editorial and carries the disclaimer "The above article is a paid advertisement or Adrants promotion." Apart from one advertiser in 2007 which used the space briefly, the position has been used exclusively for unpaid in-house promotions and announcements. Given the uproar that occurs over this line blurring stuff, we put it to you. Apart from Drudge blurring the line, does Adrants blur the line as well? We're open to your opinions on both the Drudge ad and our own ad unit. So that you can see our ad in action, here's a screen shot of the homepage with a promotional ad on it. I visit Drudge daily and I find those ads annoying (though that's hardly the most annoying content I find on Drudge). I hope Matt strongly agrees with the content of these ads, since they're basically putting words in his mouth. over 1 million unique visitors a day (enviable)...most are repeat daily visitors...the ad placement in quesion is a non-event. ...salacious subject enticements not withstanding the salacious and qwerky ads are intersperced with offers from online universities, etc. Cost estimate: $5,000 a day (envialble), so a piece now and then (OMG!) aghast at the ad spot real estate is to be expected and all such mentions are wonderful sneezes. The ad quality has improved measurably in the past nine months (imho). The disclaimer: Support The DrudgeReport; Visit Our Advertisers appears below all ad spots. Only a novice, first time peep coulkd mistake anything in this specific space for anything other then an ad, (imho). all ads are industry standard banner spaces, with the questioned real estate an in demand hot property. 728�90 180�150 300�250 120�600- cost estimates...$5,000- $10,000 PER DAY (enviable). disclaimer: ;)yes, they are a client. As a confirmed Drudge-junkie, have to say these ads are so obviously ads that only an idiot would think they aren't. I think drudge blurs the lines to new readers, but regular readers know those are ads. Just like regular readers of adrants know that you really aren't writing about how cool flip books are 8 times per month. I think this stuff can't hurt Drudge (since expectations are pretty low), but is VERY damaging for CNN. As for AdRants, I've neverr been confused by your advertising. Keep up the good work. Nice plug Arthur. Any more stats you want to push in your response? I guess I'm a novice, first time peep because these look identical to the rest of the content. I appreciate that these may be IAB standard sizes, but when part of the form factor is used as whitespace to hide the fact that it is indeed an ad, not editorial I draw the line. Put the whole ad in a border, have a note that specifically make is obvious, or give it a background to separate it from the rest of the page. I'm not horrified by this, just a bit irritated by the "quirky" decision to make them that way. Even the implication of impropriety can be misconstrued as an unethical act. Let's put it another way. This ad was specifically created for this exact placement and no other so that it would blend in and look just like the editorial content. It has a picture and text in the same font and style so that it looks like a headline - there are others like this that are not as racy. 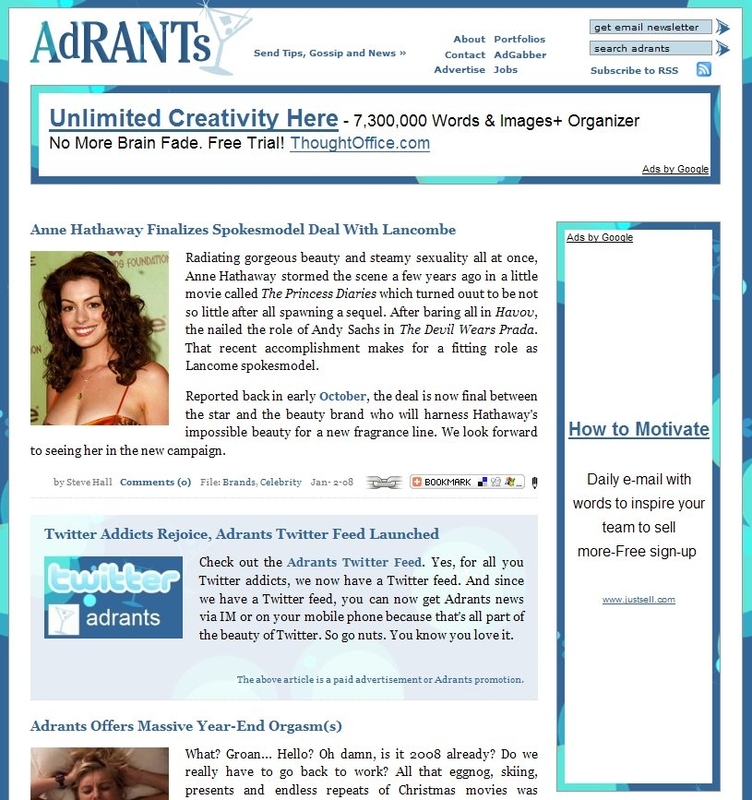 Put that ad on AdRants and everyone will know it is an ad because it is different. I have no problems with making the ad fit the page it is going on, but it smacks of misdirection when it is created to exactly mimic the editorial content. Those ads on Drudge have been running since as long as I can remember. They've always annoyed me, but I've taken them with a grain of salt. The irony of the situation is that Matt likes to link out to sites without advertising, like BreitBart.com, but will still run these on his own site. There's more irony than that but I'll stop there.